(Francisco Kjolseth | The Salt Lake Tribune) After getting kicked out of its rail-car home nine years ago, Trolley Wing Co. will once again be serving beer and chicken wings from Trolley Square's historic streetcar. Salt Lake City’s Trolley Wing Co. will once again serve cold beer and chicken wings from its namesake streetcar at Trolley Square. The original Trolley Wing Co. was evicted in 2010 by the mall’s previous owners. And the historic rail car was moved to the nearby parking lot on 600 South and wrapped in plastic, all to make way for a multimillion-dollar renovation. 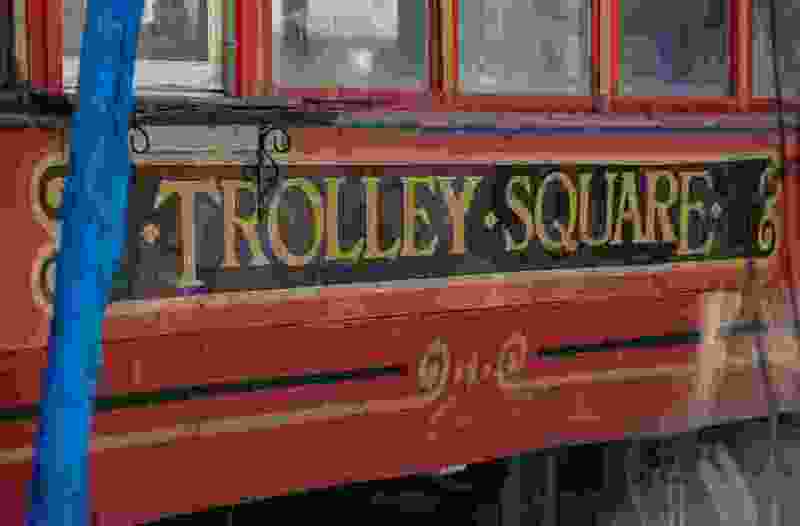 The trolley sat in the lot until last October, when SK Hart Properties — which acquired the square in 2012 — returned the century-old streetcar to its place outside the Salt Lake City shopping center on 700 East between 500 South and 600 South. Within a week of the move, Wilkerson had contacted Semnani, and the basic terms of a new lease were hammered out. Now the parties are waiting on some legal and technical details to be completed. There was no question that Trolley Wing Co. would be the perfect tenant for the space and not just because of the sentimental value. Wilkerson, who also owns his own construction company, plans to restore the trolley to its original state. Trolley Wing Co.’s story is one of perseverance and a bit of luck. Wilkerson moved to Utah in 1999 and discovered Trolley Wing Co., a quirky tavern inside a converted historic streetcar under the water tower at Trolley Square. The tavern served 3.2 beer, chicken wings and camaraderie for the Utah transplant. He bought the business in 2009 and things ran smoothly for about nine months — until mall officials told him they planned to move the streetcar, which had stood in that spot for nearly five decades, to make way for Whole Foods Market, an anchor in a renovation. Trolley Wing Co. operated in a makeshift spot inside Trolley Square for four years during the construction — only to be evicted, again. While that would have deterred another business owner, Wilkerson decided to move the business to Sugar House, where there was a glitch with zoning for a bar. Things worked out, though, and last year, he opened another bar in Midvale. The original Trolley Wing Co. was a beer-only bar, but this time Wilkerson says he will apply for a full bar license from the Utah Department of Alcoholic Beverage Control. The Trolley Square location will have 14 to 16 seats inside, but a new patio is planned. The menu will be smaller, with just the five original wing flavors: traditional, barbecue, teriyaki, cajun honey and — we’re blushing — the “four skin,” a blend of four flavors. The wings will be prepared in the larger kitchens in Sugar House and Midvale and then finished in the smaller Trolley Square kitchen.